Organise democratic defence committees to repel attacks and kick out CY Leung’s government! On Friday, October 3rd, with protests ranks dipping after six days of occupations, standoffs with police, and the end of a two-day public holiday, the mass democracy movement suffered what were evidently coordinated attacks on several fronts. In the working class district of Mong Kok, where Socialist Action (CWI) members have been very active in the ‘Umbrella Movement’ protests, criminal gangs (triads) and crowds mobilized by ‘Caring Hong Kong Power’ – a racist right-wing pro-regime group – attacked the occupation violently, tearing down tents and barricades and assaulting pro-democracy protesters while police largely stood back. The police said 37 people were injured on Friday, at least 18 of these in Mong Kok where 19 people were arrested – half of whom had “triad backgrounds” according to police. 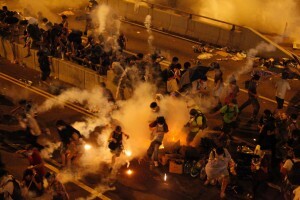 A simultaneous and identical attack, involving a similar mix of underworld and pro-Beijing forces, was mounted against the occupation in Causeway Bay, on Hong Kong Island, which provided a pretext for police to move in and clear barricades and tents, in an attempt to close down the occupation there. 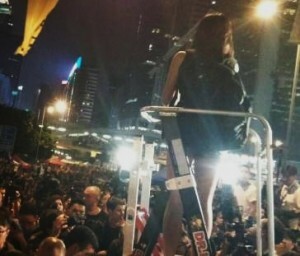 Female protesters report being pushed and threatened by the attackers: “If you come to the protests, be prepared to be sexually harassed.” A new pro-government group was formed this week, wearing blue ribbons in support of the police, as a counterforce to the yellow ribbon-wearing democracy protesters. This is only the latest of many ‘initiatives by concerned citizens’ that are, in fact, front organizations for the Chinese dictatorship (CCP). This is a tactic it has long practiced under the misnamed title of “United Front.” A video is circulating showing police outside a Causeway Bay police station distributing blue ribbons to a crowd of mostly middle-aged men who were later seen attacking the occupation. 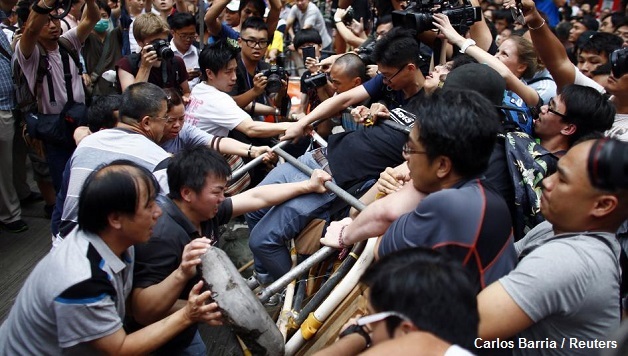 Friday’s government-inspired violence follows an attack two days earlier, carried out by a pro-regime rural organization (Heung Yee Kuk) against a campaign stall run by the pro-democracy Hong Kong Confederation of Trade Unions (HKCTU). Around 10,000 members of the HKCTU – in sectors such as transport, education and services – have been on strike since Monday, September 29th, as part of the current protest movement. This orchestrated violence is backed up by intensive media propaganda against “chaos” and “economic paralysis” which is blamed on the democracy protests. Also at the main Admiralty protest site, outside the besieged government headquarters, there is now an urgent need to organize serious defense against right-wing pro-Beijing thugs, as well as new police assaults. 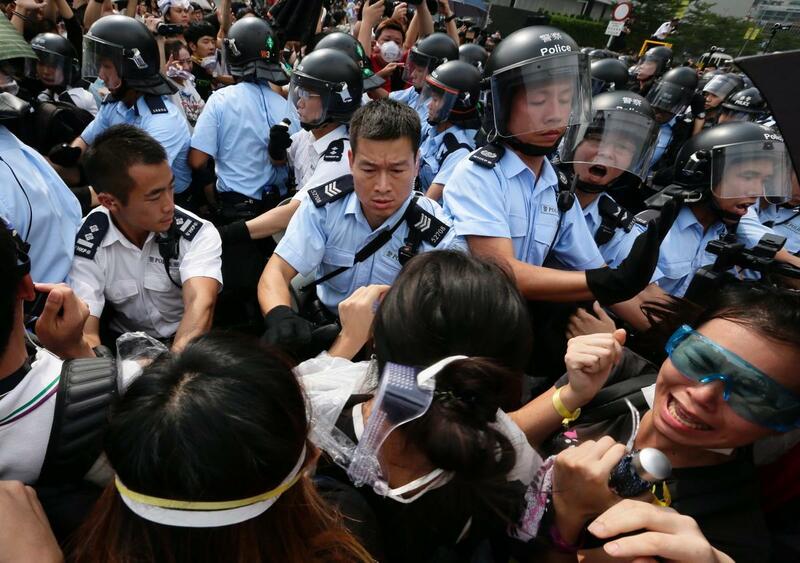 There have been clashes in Admiralty between police and protesters angered over deceitful and provocative police maneuvers. On Friday morning, for example, the police asked the occupiers to clear a corridor to allow in an ambulance for a sick policeman, only to use this to drive in truckloads of tear gas, rubber bullets, and other weaponry. A CNN journalist reported seeing containers brought into the government offices Thursday evening (October 2nd) labelled “round, 38 mm rubber baton,” which is another name for rubber bullets. The police action has effectively turned Chief Executive CY Leung’s office into an armed fortress following a threat by more radical student groups to stage an occupation there. This arose out of growing frustration among more radical sections of the youth over the government’s waiting game and violent attacks, but also a growing fear that the ‘moderate’ leaders are again looking for a way to wind down the movement. The attacks on the occupations were clearly coordinated, and followed an almost identical pattern and timing – in the middle of the day when occupation numbers were low. Democracy protesters are in no doubt that the counterstrike against the protest movement was organized and directed by the government and the commanders of the Hong Kong Police Force whose brutal gas attacks on peaceful protests triggered the ‘Umbrella Revolution’ as it has come to be known. In Mong Kok, appeals for reinforcements to retake control of the area for the protest movement saw pro-occupation crowds swell to around 10,000 by Friday evening. This is an incredible response, given that statements issued by the ‘official’ leaders of the movement – including the Federation of Students and youth NGO Scholarism – called only for people to gather in the main protest site at Admiralty. The mobilization to defend the Mong Kok protest site was an initiative of more radical and ‘unofficial’ protest groups and ordinary people. Socialist Action members, who have been an active force in Mong Kok for years, were active alongside other protesters in attempting to defend the Mong Kok occupation during its most vulnerable hours, around midday. 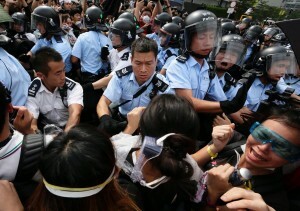 Heavily outnumbered more than 20-to-1 by crowds of pro-government attackers, the defenders were forced to pull back. One question that is puzzling many activists after these battles is the role of the so-called ‘nativists’ – a loose network of groupings that mainly mobilize through internet and combine an ‘anarchistic’ denunciation of all parties and ‘leaders’, with pro-independence ideas, but also crude anti-mainlander racism. These groups have also been active in the Mong Kok occupation. But this ‘activity’ is often directed against other groups, especially Socialist Action, whose street meetings and leafleting the ‘nativists’ have attempted to disrupt. Yet the ‘nativists’ were conspicuously absent on Friday when the pro-government forces launched wave after wave of attacks upon the occupation – the major news item throughout the day. Evidence is beginning to emerge that the CCP has infiltrated some ‘nativist’ networks. Last December, a group of ‘nativist’ protesters ran into the PLA (Chinese military) garrison in Admiralty waving a British colonial-era flag and calling for the PLA to “get out of Hong Kong!” One member of this group has subsequently been unmasked as a CCP member and expelled. While to some it might seem contradictory for Beijing to be goading and manipulating pro-independence groups, it is in fact famous for deploying such Machiavellian methods. While the degree of CCP penetration of such groups is not clear, there is no doubt that Beijing exploits the flag-waving anti-mainlander antics of the ‘nativists’ – giving them massive media attention inside China – to portray the democracy movement as ‘anti-China’ and to justify greater political repression. The struggle to defend all the occupation sites is an important issue. Having several occupation sites increases the protest movement’s effectiveness in economic and even more importantly in political terms. But perhaps it is most important effect is making the occupation more resilient to police attacks. The decentralization of the occupations into four sites – at one stage – was a response to the vicious police offensive of September 28-29 that aimed to break the current movement. It was a brilliant and wholly improvised tactical response from the protesters that instantly threw off police commanders and magnified their strategic problems. The police game plan for crushing the occupation movement had been based on the notion of ‘Occupy Central’ (a campaign led by liberal professors that never actually materialized) – i.e. for just one site, which could have been far more easily surrounded and defeated. Pressure is also emerging within the ‘Umbrella Movement’ from sections of its leadership uneasy over the existence of so many protest sites. This makes the movement much harder for these largely self-appointed leaders to control. 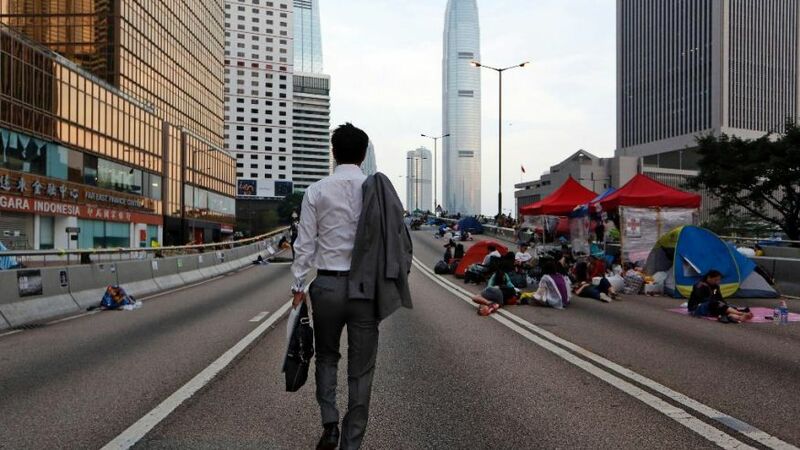 The ‘moderate’ bourgeois pan-democrats who today are the dominant political influence within this movement, have been completely stunned – almost as much as the Hong Kong and Chinese governments – by the scale and fighting spirit of these protests. These politicians have always dreaded mass struggle, which they know can be radicalized and slip beyond their control. “At present, the status quo is confusion,” said former Democratic Party leader Albert Ho Chun-yan. Bourgeois politicians like Ho have on many occasions opposed mass struggle and given credence to government scare propaganda against ‘extremism’ and ‘violent protests’. This was the case when many pan democratic politicians condemned protesters including LSD legislator ‘Long Hair’ Leung Kwok-hung after angry protests at a government consultation forum in 2011. ‘Long Hair’ recently served one-month in prison on trumped up charges arising from this protest. The alleged ‘violence’ in this case concerned a few broken flower pots and a damaged door, which even the court did not blame on ‘Long Hair’ – who himself was assaulted by a government supporter at this forum. This and other incidents have been seized upon by moderate pan democrats to denounce ‘violent protests’ – particularly when they were fighting elections (for district councils in 2011 and the legislature in 2012) and faced a big challenge from more ‘radical’ candidates. So today it is not surprising if moderates like Ho are “confused” by an unprecedented mass struggle. 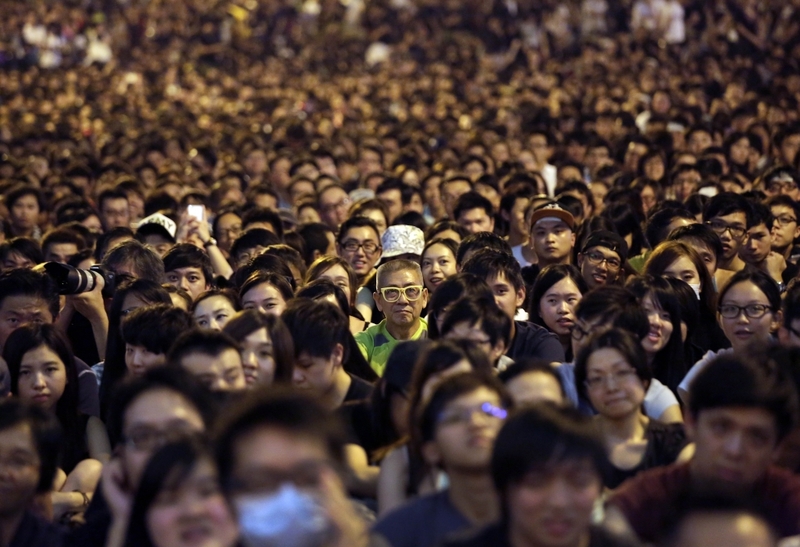 But the striking thing about the Hong Kong movement is rather the clarity of purpose and decisive actions of the youth, students, and ordinary working people, in their daily standoff with the government and the police. The ‘moderate’ pan democrats’ aim is to strike a compromise – a ‘pragmatic solution’ – involving what can only be peripheral concessions, leaving the current dictatorial governments in power (with or without CY Leung). This is not an agenda for ‘full democracy’ as demanded by the masses and therefore risks unleashing massive dissatisfaction. The current violent attacks against the mass movement are part of a government strategy, as Socialist Action warned would be the case, to increase the pressure on the ‘moderate’ pan democrats and groups like ‘Occupy Central’ (OC) to seek a way out through ‘compromise’. The attacks also increase the edginess of the ‘moderate’ leaders as they cannot control the protests. They would clearly prefer to re-centralize the protest movement into one – more easily controlled – protest site. This explains why, while they have condemned the violent attacks and criticizing the role of police, there is an evident lack of interest from these leaders to call for the continuation – and defense – of the Mong Kok and Causeway Bay occupations. At this stage of the struggle, with the initial surge forward hitting a plateau, reinforced by the lack of any clear strategy or real leadership, there is uncertainty over where the movement should go and what its demands should be. A key question is the attitude towards negotiations, which the government long refused. Too many times in Hong Kong, a mass protest movement has been left empty-handed because the leaders are not under democratic control and, while there are thousands of single-issue NGOs, there are no genuinely mass organizations, especially workers’ organizations. The bourgeois politicians who dominate the democracy struggle at this stage do not want a revolution – ‘umbrella’ or otherwise – because they share the fear of the capitalist class that this will go beyond calls for one-person-one vote (bourgeois democracy) and begin to directly challenge the big corporations and banks that are bleeding the people dry. Too often the pan democratic leaders have walked into the trap of fake dialogue with CCP dictatorship or its local minions – dialogue that only has one purpose: to get people off the streets without offering any real or meaningful change. Already there is division within the movement on this crucial question. The main student groups initially declared correctly that negotiations are ruled out while CY Leung remains in office – this is a minimum position! Yet when the government made the offer to meet protest leaders on Thursday evening, October 2, a plan obviously approved or dictated by Beijing, the ‘moderates’ and especially the ‘OC’ leaders seem to have exerted pressure on others including the students to agree to talks. This is linked to the fears of the pan democratic politicians that they have lost control over the movement. The attacks in Mong Kok and Causeway Bay then cut across this development, with mass pressure increasing upon the student leaders to change their position and say no to negotiations. Meanwhile ‘OC’ leaders have hinted they are still open to talks with the government. Their eagerness to shift the struggle from the masses on the streets to leaders sitting around a table is part of the political ‘DNA’ of the ‘moderate’ pan democrats. They want to use any talks to claim “a moral victory” arguing the mass protests should be ended “for now”. Yet such a position would be disastrous. This would mean throwing away the enormous momentum the mass struggle has acquired and letting the government – which has bottomless reserves of dishonesty and scheming – off the hook! The successes of any struggle, especially such a historic movement, have to be measured by concrete gains, not empty promises. This means nothing less than the downfall of CY Leung’s cruel and corrupt government, and a refusal to accept any successor other than through a genuinely democratic election, without the CCP’s Big Business-dominated nomination committee. There must be no restrictions on which candidates can stand. As far as Socialist Action is concerned, this also means the replacement of the current rubber stamp legislature with a genuine people’s assembly, with its members fully elected, subject to popular recall, and paid only a skilled workers’ wage. As in Scotland’s recent referendum, the voting age should be cut to sixteen, with young people having shown beyond any doubt the crucial role they play in society’s political development. Socialists are not dogmatists who rule out the idea of negotiations on principle. There are many occasions when in a workplace struggle or social movement socialists among the leadership would enter into negotiations, providing this is backed up by the pressure of mass action. But talks with this Hong Kong government – under orders from a dictatorship that will never negotiate away its power and control – is a recipe for certain failure. This is especially so if the negotiators are the same ‘moderate’ pan democratic leaders whose compromise approach has not yielded a single real democratic advance in more than three decades (and who played no part in launching the current mass movement). Socialist Action, as a Marxist organization, serves as the memory of the working class movement. We remind the masses of past mistakes – the bitter experience of betrayals in the history of Hong Kong’s democracy struggle – so these lost opportunities can be avoided in the struggle today. This magnificent mass movement has captured the attention of the whole world, especially workers and youth. There have been outpourings of solidarity from all over the world, including from workers’ organizations from the Philippines to Britain. 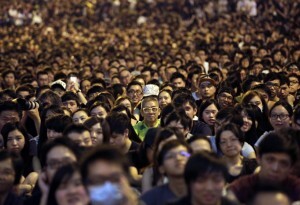 During the ‘National Day’ holiday (October 1st) the crowd numbers taking part in Hong Kong reached 200,000 or more. Socialist Action has played an active role in the occupation movement and the school strike from which it developed. We link the democratic struggle to the need to fight capitalism, particularly the need for a new mass workers’ party to coalesce from among the working class and left layers of this movement. This is needed to challenge the dictatorial economic power of Hong Kong’s tycoon families and build support for a socialist alternative with democratic public control over the banks and property companies as the only way to relieve the unbearable burden of housing costs – officially the ‘most unaffordable’ in the world – as well as the scourge of poverty, stagnating real wages and privatization of public services. Socialist Action also, as one of the few voices in this movement, calls for the struggle to be spread to the mainland, by supporting illegal workers’ struggles in China’s sweatshops and the fight against state repression. This is the only viable strategy to defeat the CCP dictatorship, which today constitutes a seemingly insurmountable ‘roadblock’ for democracy in Hong Kong, as well of course as China itself. Unfortunately, many of the protests groups, especially those influenced by liberal pro-capitalist parties like the Democratic Party, do not see the need for this or indeed reject this as ‘interference’ in China’s affairs that will provoke the dictatorship to take an even more hardline stand. But ‘self-censorship’ and attempts to separate the two struggles are a seriously flawed approach that actually strengthens the hand of the Chinese regime. The ‘umbrella’ must be passed from Hong Kong to China, and the sooner the better. But this requires a program based on the interests of the working class and the poor, in China and Hong Kong, as opposed to the interests of the capitalists who anyway are firmly in the anti-democratic camp. Socialist Action has consistently argued that mass democracy protests must be organized on democratic lines, with elected action committees open to all participating groups to run the occupations, coordinate with striking workers and students, and to take all major decisions on the future tactics, including what attitude to take towards eventual concessions or offers of talks from the government. We faced criticism and bureaucratic attempts to block our activity from some of the groups within the democracy struggle, when during the 100,000-strong movement against school brainwashing in 2012 we warned against allowing a ‘small circle’ leadership to decide everything without an open and democratic approach. Yet this proved to be a decisive problem when that movement was suddenly and inexplicably called off without obtaining a full reversal of the government’s reactionary policy. Unfortunately, there is a similar absence of democratic structures today, and while the largely spontaneous and loosely organized occupation ran with an impressive energy and smoothness in its first days, this model of conducting a mass struggle is now being severely tested by the government’s campaign to terrorize the occupations. The violence against the protest movement makes the issue of democratic organization extremely urgent. This can only be solved by setting up action committees in every occupation, to coordinate mobilization and especially to organize self-defense, with similar democratic bodies established in schools and workplaces to build the strike movement. These committees must decide tactics and which political responses are needed through open and democratic discussions. Only a fully democratic movement is capable of defeating the government. Support and extend the ‘Umbrella Revolution’ – build democratic action committees to decide the next steps and organize self-defense against government orchestrated violence!